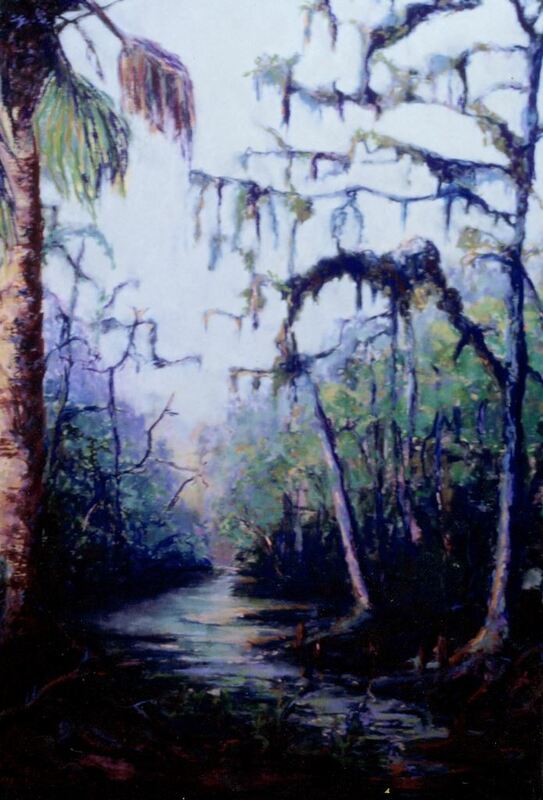 A painting of the Econlockhatchee River by Bettye Reagan, a local artist in Central Florida. Called the Econ River for short, this tributary is the longest river in the state of Florida. The Econ River flows north from Lake Conlin, through the Econlockhatchee River Swamp, joining the St. Johns River near Puzzle Lake. Original painting: Reagan, Bettye. Econ River. 2002: Private Collection of Bettye Reagan. Digital reproduction of original painting: Reagan, Bettye. Econ River. 2002. "Econlockhatchee River." St. Johns Water Management District. http://floridaswater.com/middlestjohnsriver/econriver.html. Reagan, Bettye Jean Aulin. 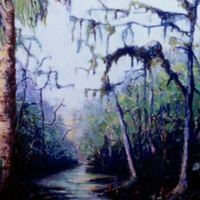 “Econ River by Bettye Reagan.” RICHES of Central Florida accessed April 26, 2019, https://richesmi.cah.ucf.edu/omeka/items/show/6967.